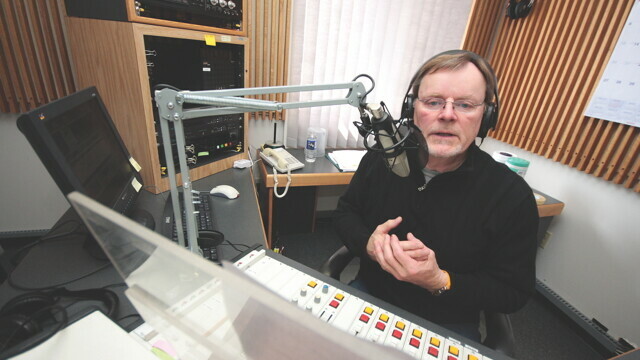 Wisconsin Public Radio’s Al Ross uses the near-magic power of radio waves to inform and entertain the masses from WPR’s Eau Claire studios. Every Friday evening at 5pm, radio fans from Chetek to Black River Falls have an opportunity to experience an auditory cornucopia of the arts throughout Western Wisconsin. Al Ross, host of Spectrum West on 88.3 WHWC FM, showcases a wide swath of the artist community covering everything from theater and music to visual arts and literature. “We try to juggle topics and events making sure all our categories: art, music, literature, theater, and the humanities get equal time along the way,” Ross says. In covering such a wide range of arts throughout Western Wisconsin, Ross has found little to no difference between the art scenes in larger and smaller communities. He even says, “small town folks in Western Wisconsin do a great job satisfying what appears to be an insatiable appetite for things artistic, creative, and meaningful. Spectrum West is not Ross’ first radio rodeo. He is a 40-year veteran of the field. When asked which changes in producing radio he likes most, he emphatically states that digital editing has made his life easier. “I can’t even begin to imagine producing a show like Spectrum West with all the editing that’s necessary back in the good ol’ days of real-to-reel tape, marking, taping, and razor blades,” he said. Covering visual arts over the radio can be a challenge for any radio producer. But Ross uses comments such as, “that’s a very striking shade of red,” and “it’s amazing the way the light bounces off all the angles off that piece,” to help readers create their own mental imagery.